BABY TOWEL DETAILS: A perfect starter towel for baby at 72cm x 72 cm, it is made of 100% cotton, is machine washable and will last your baby a lifetime. It won't lose it's shape and absorbance even after hundreds of washes. UNISEX DESIGN: Whether you are buying for a baby boy or baby girl, this towel is perfect. ALL kids love the adorable BooBaa baby. 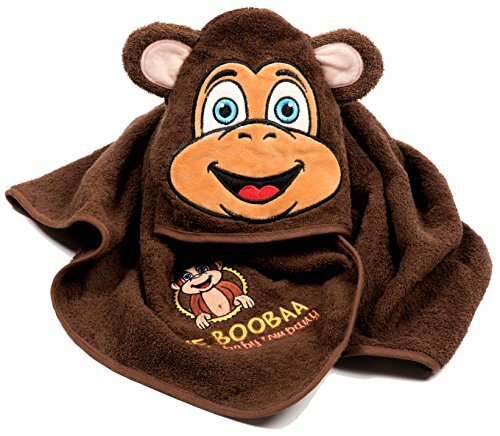 The hooded design ensures that the towel stays snug and surrounds your baby keeping him warm and dry. Perfect for both bathtime and for use by the pool or when heading to the beach. UNCONDITIONAL LIFETIME GUARANTEE - Our product Guarantee is a simple one! Follow the product care instructions and if for any reason the product does not meet your expectations, simple return it to us with proof-of-payment and we will refund your purchase price. No hassles! No Excuses! No Delays! YOUR PURCHASE CHANGES LIVES - A portion of your purchase goes to support the McMaster Children's Hospital, a leader in pediatric evidence based care, collaborative research and innovative leading edge education. Nothing is more precious than our children and we at The BooBaa Baby Company thank you for your part in supporting such an important and noble cause.